Havent looked "out there" for several days, been too busy. The BOM have advised of a warm outbreak mid next week. Is there a change of a stormy change at the end of the week???? ... and maybe the break of the sunny period at the end of this week might leave Vic troughy right through to Tuesday week??? Just looked at the latest AccG, it seems to think that the troughy period we are about to enter later tomorrow might hang around for ages (well 7 days) and finish it all off with a "bang" courtesy of a cut off low spawned from a cold aired LWT that passes by close enough to leave a "knot" behind amongst the lingering humidity. There IS weather for Vic to keep us keen for a week! Bring it on. I agree with you Petros. It will be an interesting next 7 days, starting from tomorrow night? 3. 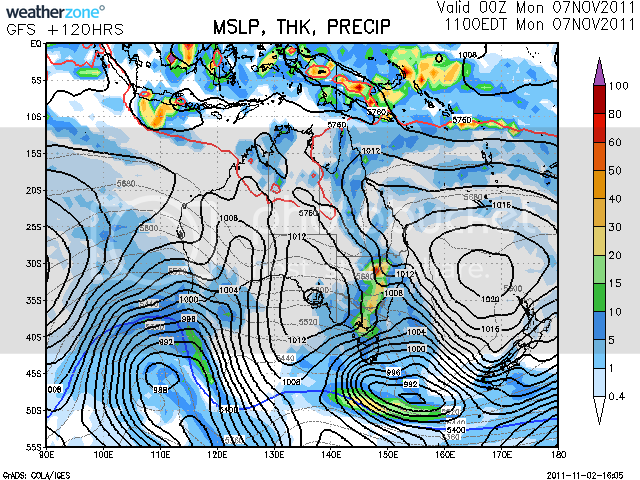 An Easterly dip situation... a general large scale inland low system over inland E Aus. Dont ask me! - I'll just go by "where theres smoke theres fire" (the betting side of me puts 2 bob on the Easterly dip . Its gotten moist outside here in Vic right now and I cant see it going away real fast. EC is progging me 27mm over late next weekend - not supported by AccG/R, CMC or GFS - has anyone else got progs like this in Vic?? EC is progging me 27mm over late next weekend (29-30/10/11)- not supported by AccG/R, CMC or GFS - has anyone else got progs like this in Vic?? The BOM on ABC radio yesterday said change arriving to west Vic on friday and passing state on saturday.The BOM wind forecast map indicates a developing embryonioc ECL on the sunday night on the far east coast of Vic. In the past this set up of ECL development has seen Vic with an arching jetstream over VIC and some rain. I would agree with EC and your rainfall forecast petros. The arch on the jetstream is not in view yet. 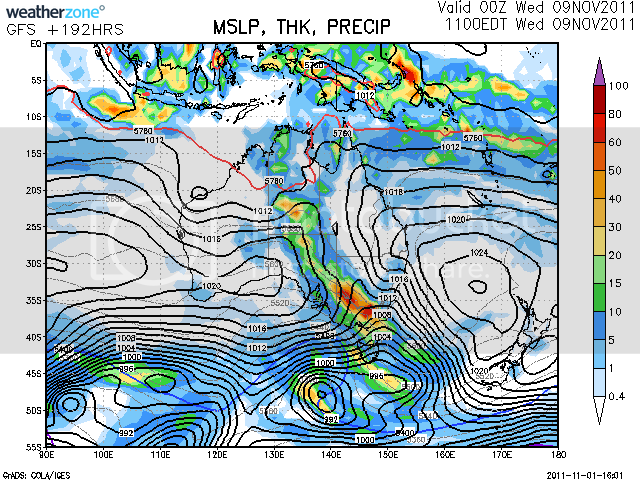 AccG's latest run shows the chance of Vic being in a troughline Wed/Thurs next week. More storms to follow up what we get on Fri-Sun this weekend in Vic? The main thing to me is the continuance of moist air supply in Aust mid inland SE that should take much to draw back down onto us again circa mid next week. Petros.Any chance you could post the AccG diagram for your above post. Would be good to follow and look back after the event. Good to look back and see their performance. I noticed the ACCESS G forecast you posted above is only one day out. ( early).Will be interesting to see fridays rain totals and compare. EDIT. No ECL on sunday with the Wind forecast update but a small low on the S/west coast of vic embeded in trough on Saturday . The trough between the 2 high centres looks less likely, it looking like the centres of this double-yolker might merge. Fast looming into the postable range for a new thread (be it warm sunny days OR troughy stormy days ). - sorry Crikey, just realised that what you meant was post the "early-thus-inaccurate" chart that we are commenting on at that time. Noted. Edit Reason: The light just came on.. THe GFS 148hr forecast for next thursday the 3rd November( 6 days out) you posted above petros has some interesting features to 'toy with'. The next trough has similar features to this one in that a low is forming off the S/west coast of WA and moves across OZ . And so you would expect a similar scenario to now in that a broad trough brings thunderstorms and rain to the interior once again and we in Vic are likely to get a repeat of this weekend in the future around about the Saturday 5th November. 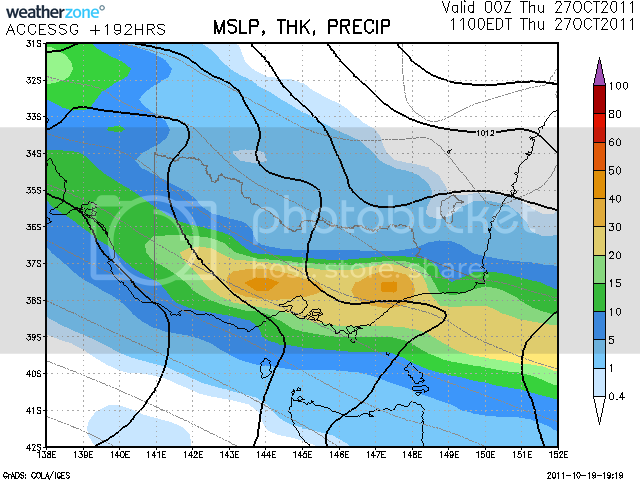 For Queensland the northwest/s/east trough line pattern continues and so more of the same for Queensland. Synoptically speaking it looks more of the same .The pattern of long broad troughs in between quite large highs. 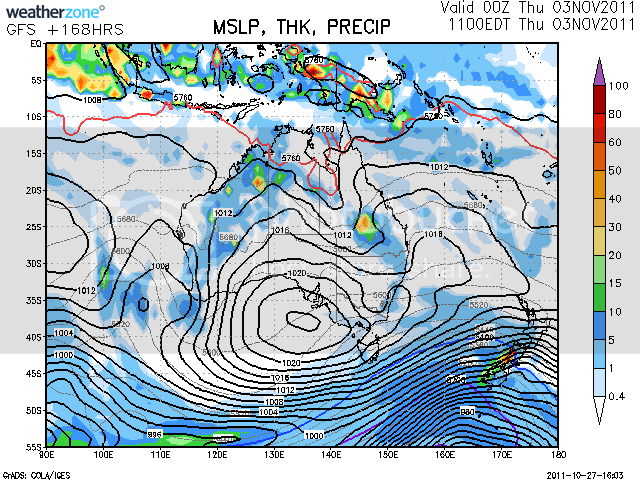 Looks like any significant wetness from the next event will be Sunday night-Tues across Vic?? I am looking forward to the next system with the hope that some significant rain may come from it. So even though I may not comment I am reading this thread with great interest. GFS and AccG show sultry air to again be drawn into Vic from the N & NW early/mid next week due to a lazy departure of the high system building now (read blocking low E of NZ if I'm right). This moisture looks to be upset by a passing LWT licking us early next week allowing the chance of storms, coldness or even a cut-off low. If someone wants to start a thread for this, I'll post a chart or two as they prognose 5-6 days out. As usual, the last system this past weekend was another example of "where theres smoke, there'll be fire" for models sniffing things "out there". Mods.... - whats wrong with a one hour edit time (or more)? GFS shows the arrival of the above-mentioned moisture midday next Monday and a cold air mass gathering in the bight, looking set to arrive into Vic Tues/Wed to stir things up somewhat. Could one brave Victorian please start a thread to discuss this potential event, next Sunday is now in the "allowable zone" for the purists. Going back 2 post to next Monday (well inside the allowable thread creation range for most), it now looks like Monday will provide a good opening burst to the weather to follow during the week. It should be an interesting week and involve storms, just wish others would comment or start a dedicated thread for this. Hi Petros. Just had a brief look at the BOM wind forecast map for this period .There is one thing l can say. The wind map indicates a period of what l could say somewhat erratic wind flow patterns. in other words not very neat. Over Vic the wind flow seems to vary from day to day . Sometimes a .low pressure flow and then anti-clockwise flow.It would seem the highs and trough do a bit of volleying for position in and around VIC ? which would make outcomes a little difficult l would have thought. If that were to pan out it could ? limit the precipitation potential . The GFS model( wednesday 9th NOV)) above has some heavy rainfall at barom pressure of 1008 and 1012. I didn't feel comfortable with that.Also the s/west flow which rarely gives us in the north some heavy falls l am sure? 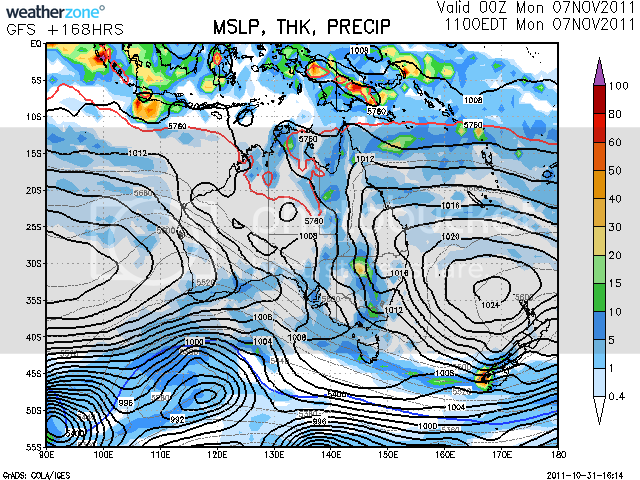 It looks as though it is relying on a moisture laden North west infeed passing over Vic. Look forward to how it pans out. One thing l do like is the strong equatorial in-feed into the the mid-latitude belt of the southern hemisphere at the moment as seen on met office world satellite imagery. 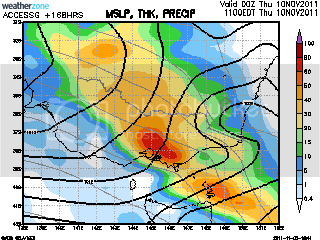 Yep Crikey, the the strong equatorial in-feed remains the key to the ammount of rain Vic may get mid/late next week. Still looks "on" from my take on things. Generated in 0.024 seconds in which 0.010 seconds were spent on a total of 14 queries. Zlib compression disabled.